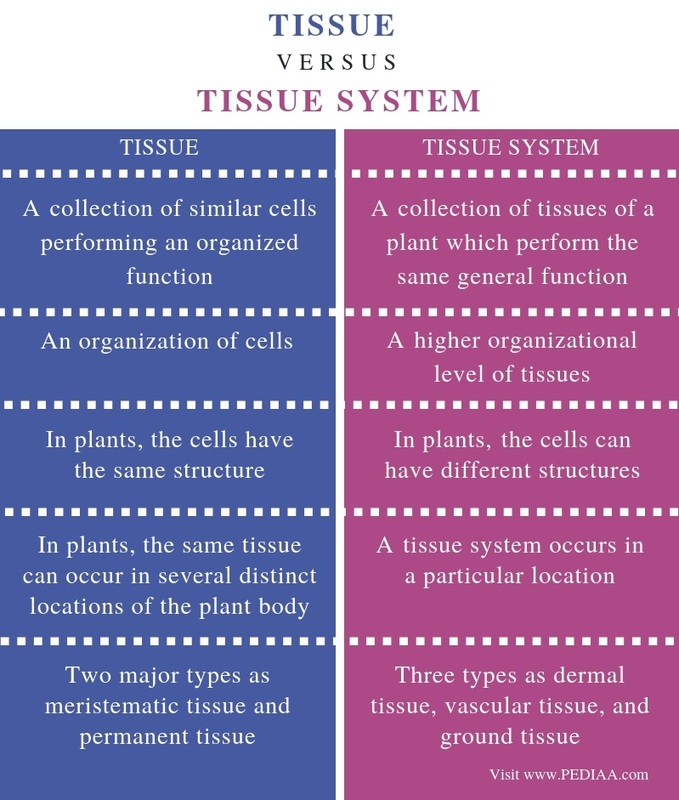 The main difference between tissue and tissue system is that tissue is an organization of both structurally and functionally similar cells whereas tissue system is an organization of functionally similar, but structurally dissimilar cells or tissues. Tissue and tissue system are two organizational levels of functionally related cells in plants. Furthermore, the two types of tissues in plants are meristematic tissues and permanent tissues while the three types of tissue systems are dermal tissue, vascular tissue, and ground tissue. A tissue is an organization of both structurally and functionally related cells. In simple words, a tissue consists of the same type of cells that perform the same function. When considering plants, all types of tissues fall into two main categories as meristematic tissue and permanent tissue. Meristematic tissue is the plant tissue with undifferentiated cells. This tissue contains actively-dividing cells. The main function of this tissue is the primary growth of the plant body. Therefore, meristematic tissue especially occurs at the tip of the stem and the root. The three types of meristematic tissues are the apical meristem at the tip of the stem and root, lateral meristem beneath the bark including cork cambium and vascular cambium, and the intercalary meristem between permanent tissues. Permanent tissue is the plant tissue with differentiated cells. This tissue contains dead cells as well. Simple permanent tissue and complex permanent tissue are the two types of permanent tissue. The cells in the simple permanent tissue have a similar origin. Meanwhile, the four types of simple permanent tissues are parenchyma, collenchyma, sclerenchyma, and epidermis. In comparison, complex permanent tissues contain more than one type of tissues. The two types of complex permanent tissues are the xylem and phloem. Xylem is responsible for the conduction of water from roots throughout the plant body. 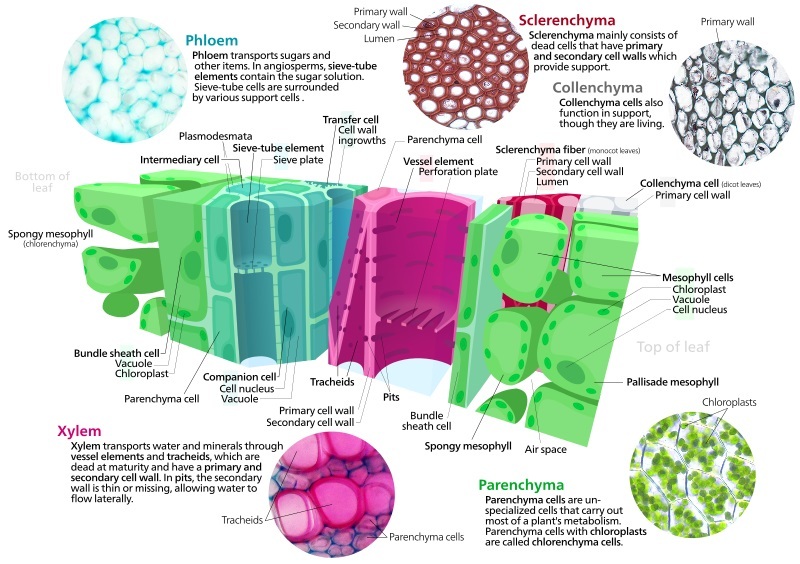 Tracheid, vessels, xylem fibers, and xylem parenchyma are the four types of cells in the xylem. On the other hand, phloem is responsible for the transport of food substances throughout the plant body. Sieve tube, companion cells, phloem fiber, and phloem parenchyma are the four types of cells in the phloem. A tissue system is an organization of several, functionally related tissues or cells in the plant body. In fact, it is a collection of permanent tissues in a similar location, performing a similar function. The three types of tissue systems in the plant body are the dermal tissue system, vascular tissue system, and ground tissue system. Also, all of the three tissue systems occur in each plant organ, the stem, root, and leaves. Dermal tissue system is responsible for protecting the underneath tissues of the plant while allowing the gas exchange. The three types of cells in the dermal tissue are epidermal cells, guard cells, and trichomes. A waxy cuticle covers the shoot system of the plant. In addition, stomata are the pores which facilitate the gas exchange. In the root, it is responsible for the absorption of water as well. Furthermore, trichomes are the hair-like outgrowths of the epidermal cells. Vascular tissue system is responsible for the transport of water, minerals, and sugars throughout the plant body. Moreover, the two types of vascular tissues are the xylem and the phloem. Ground tissue system is the supporting tissue system of the plant. The three types of cells in this tissue system are parenchyma, collenchyma, and sclerenchyma. Depending on the location, these cells may also perform other functions including photosynthesis and storage. Tissue and tissue system are two organizational levels of plant cells. Moreover, they contain functionally-related cells. Both types of organizational levels aid in functioning as a whole unit, increasing the efficiency of the function in plants. A tissue refers to a collection of similar cells performing an organized function. A tissue system refers to a collection of tissues of a plant which perform the same general function. Thus, this explains the main difference between tissue and tissue system. A tissue is an organization of cells while a tissue system is a higher organizational level of tissues. Structural similarity is also a major difference between tissue and tissue system. In plants, the cells in a tissue have the same structure while the cells in a tissue system can have different structures. Another difference between tissue and tissue system is their location. In plants, same tissue can occur in several distinct locations of the plant body while a tissue system occurs in a particular location. The two major types of tissues in plants are meristematic tissue and permanent tissue while the three types of tissue systems are the dermal tissue, vascular tissue, and ground tissue. Hence, this is another difference between tissue and tissue system. A tissue is a cellular organization that can perform a particular function. The two main types of plant tissues are the meristematic tissues and the permanent tissues. Moreover, plants consist of three types of tissue systems as dermal, vascular, and ground tissues. However, the tissue system is a localization of several, functionally-related tissues. Therefore, the main difference between tissue and tissue system is their organization.